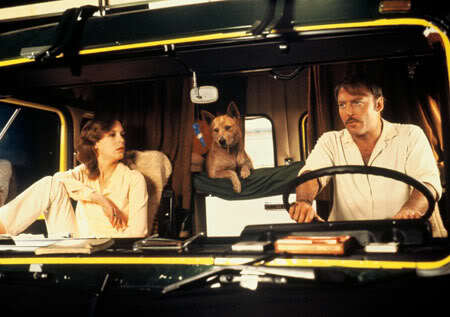 Stacy Keach plays a truck driver who likes to play games on the road with his dingo companion in order to eliminate some of the boredom of long drives across Australia. After hearing about a serial killer on the loose who cuts up and disposes bodies all over the place, Keach begins to suspect a man who drives a green vehicle. Since the two stopped in the same area for the night, Keach sees the mysterious potential killer watching the garbage being collected very early in the morning. (As his dog sniffs the garbage bag of interest in an attempt to get food.) Jamie Lee Curtis plays the hitchhiker who Keach picks up and who is eventually taken by the killer. I’ve read from other reviews that Richard Franklin, the director, was a very big fan of Alfred Hitchcock. Being a fan myself, watching this movie was that much more fun for me because I actively looked for certain shots and twists in the story that could reference to Hitchcock’s works. But even if one is not familiar with Hitchcock’s movies, one could still enjoy this psychological thriller because of the suspenseful false alarms and eventual real dangers that the characters had to face. I thought “Roadgames” was very different from other movies about killers on the road (especially American movies of the same set-up). Franklin took the time to establish Keach and Curtis’ characters before really getting into the scares. They talked and formed a genuine connection, so when the two were finally on the killer’s tracks, we couldn’t help but care and wonder whether they really were on the right track and whether or not they would eventually get caught. My favorite scene was when Keach investigated the number of meat in the back of his truck. That scene was done so well because at first I had no idea what he was thinking. But when I finally caught up on why he was so worried, I was so disturbed and I could remember saying out loud that he should get out of the truck as soon as possible. My heart raced so fast because the camera just lingered there as if something was about to go seriously wrong. The scene after that was also very impressive–very Hitchcockian–the way the character got into his own head and trying to persuade himself that everything was alright (which, of course, was not the case). “Roadgames” is now considered a cult classic cat-and-mouse movie and I believe it still holds up today. I wish more people would see this because it did many things that were so unexpected. Instead of simplifying things for the audience, it actually tried to outsmart us which I found to be very refreshing even though it was released back in 1981.